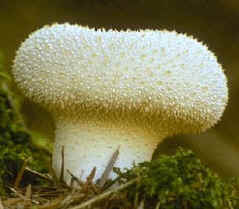 The globular fruiting body is carried on a stalk and is 2 - 9cm high. In this species it is covered in short pyramidal warts which rub off. 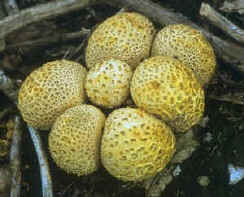 The base of the fruiting body is solid and sterile and the olive-brown spore mass is inside of the globular head. The spores are liberated through a pore on the top. Habitat: In woodland, in summer through to late autumn. These are fungi in which the fruiting body starts out as a ball. The wall (or peridium as it is correctly known) is composed of two layers. When the fruiting body is mature, the outer layer splits and when wet, opens out in the shape of a star. The spore mass remains inside the inner wall layer and spores are released through a small pore in the wall. 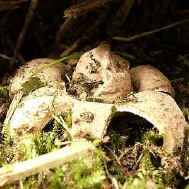 The fruiting body is an irregular ball, covered with rough scales and attached to the soil by a thick mycelial strand. The fruiting bodies are 4 -10cm across. The interior of the ball is filled with a dark, powdery spore mass. The spores are liberated by the ball breaking open irregularly as it matures. Habitat: woodland and scrubby heathland, through late summer and early winter.